Have you ever Googled yourself before? If not, you might be surprised to see what your virtual identity looks like because everything you do online is collected into a digital dossier, otherwise known as your digital footprint. This footprint is traceable by others and is virtually impossible to eliminate. Our students must become aware of their digital identity, so that they can learn how to manage and develop it into a positive one. It is imperative that they keep themselves and their personal information safe as the lines between the digital and real world have become blurred. Tips retrieved from Educational Technology and Mobile Learning. 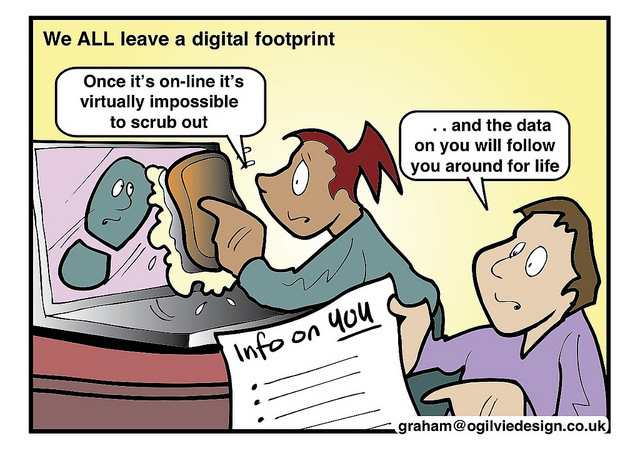 Digital Tattoo - If we looked you up online, what would we learn about you?